In January 2016 a group of street artists were invited to come and stay and redecorate. 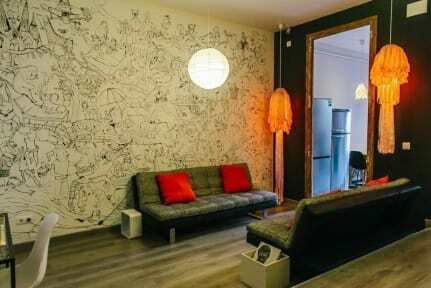 The result is a selection of uniquely decorated bedrooms, most with balconies or a terrace, all with private bathrooms, air conditioning, safe and hairdryer. Guests have use of a large fully equipped kitchen, with coffee and tea, and two large fridges for storing any food and drinks you wish. Perhaps the star attraction is the fabulous terrace with and hammocks, BBQ and lots of space, where you can forget where you are and just chill out. 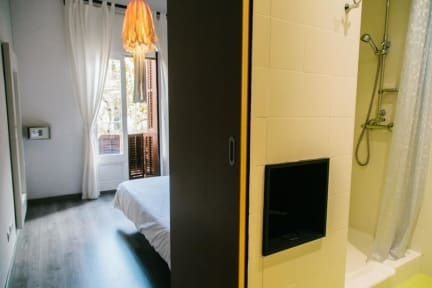 The location of Zoo Rooms is in the heart of the Eixample area, was carefully chosen so our guests would get a better city experience and level of comfort and relax that you just won't find staying in the old town. You'll find many of the city's best attractions within walking distance, including iconic Gaudi buildings such as La Pedrera and Casa Batll.